Submit your video by posting on your Instagram the disc trick video and tagging @flydiscs. We will select winners based on best trick and most creative video! Our winners will get to design and order their own disc golf disc on our site for FREE! Want to Customize a Putter? Getting bored of posting selfies and pet pics on your Instagram page? The 50 Putt Challenge is here! Brought to you by @brad_disc who started the competition on Instagram a couple months ago. Can you beat his score of 46/50 shots made in the basket from 15 feet away? We want YOU to submit your video for a chance to win your very own custom putter. Submit your 50 Putt Challenge Videos using hashtag #50puttchallenge for a chance to win a Free Custom Putter! @brad_disc for 46/50! Can you beat his score 15ft away?! This is not as hard as it seems to set up and you certainly don’t need 50 putters like @brad_disc. You can use one, and keep getting it after every shot. First, set up a basket in the corner of the room, or yard. If you don’t have a basket, take a bucket and tilt it sideways on some sort of ledge. Be sure that whatever you choose to use for a basket, is the correct height (around 3ft tall). Now that we have everything set up, have a friend film you, or prop your phone up and film yourself putting 50 times from 15 ft away! Submit your video by posting on your Instagram the putting video along with your score /50. Hashtag #50puttchallenge and tag @flydiscs in your post. We will select winners based on best putter and most creative video! Our winners will get to design and order their own putter on our site for FREE! Okay, so you’ll want to find a venue that allows for this graduation BBQ-style disc golf tournament. I suggest, going to your local disc golf course, and asking if it’s possible to host a BBQ there. If not, you’ll have to create one yourself, which is not hard. What you’ll need to do is find an open field, park or backyard. You can design your own course, numbering each hole. If you don’t already have baskets, there are ways to get creative to make your own. If you want to get professional, here are some PDGA quality disc golf baskets you can purchase. Once you have the course set up, work on creating a homebase for food and drinks. A white party tent, picnic tables, or BBQ would be a great idea for setting up the party. That way, everyone can meet back for drinks and cake after the match. 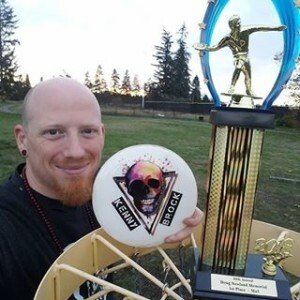 Something that would make this party truly unique is designing custom disc golf discs for the big game. Something that showcases your successful year, or even just a great photo of your graduating class. 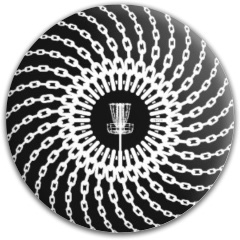 Another idea is to make a custom disc trophy, for the winning team. 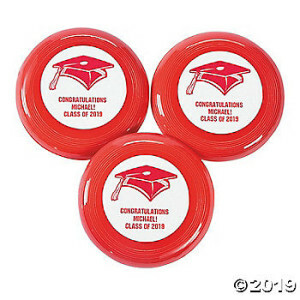 You can decorate discs and write “Pete’s Disc Golf Graduation Party Tournament Champs!” There are so many cool ways to decorate your disc golf discs to make your party super memorable. There are a couple techniques when driving those long distance shots. Sidearm, Backhand and overhand shots depend on a few different elements. You should always keep a few things in mind when preparing for any shot. The wind, the slope of the ground and where obstacles are just a few elements to think about before driving. The backhand driving technique is best used when you are throwing for consistent distance. Approach your mark with an x-step, turn your hip away from the target and allow you arm to pull across your chest. Pro Jeremy Koling provides information on the three most common techniques of distance driving. When attempting a side arm distance shot, you really want to make sure your palm is facing the sky through your follow. You don’t want to roll your wrist over. Finally, the hook thumb, which is best for higher throws, is all about the grip. Make sure you have a tight grip and toss up at 12 o’ clock. Watch the clip below to see how Pro Jeremy Koling uses specific techniques of distance driving. Video yourself throwing each shot and make note on how you can improve your positioning. Start by mastering your foot placement. Once you get your stance, work on your swing and wrist snap. Finally add the foot placement and swing together to create a rhythm that works for you. There are many different ways to play the great game of disc golf. Players are getting super creative with setting up nets, pretty much anywhere but one of the most fun, and most unique is playing at night. Playing disc golf at night is not as challenging as you would think, however it does require some planning. The key to success is glow in the dark nets,discs and of course, a flashlight. Night Golf does require some heavy planning. After all, you don’t want to be stranded in the dark not knowing the course or where the baskets are. First, you would want to find a place to play. Most local courses offer night disc golf. If you can not find one that does, you can make your own course. The best places to make a course are open fields like, soccer feilds, parks or maybe your friends backyard. Some players are even brave enough to set up courses on trails in the woods. Secondly, you’ll want to bring a backpack filled with all your night disc golf essentials. We recommend you bring the following: a flashlight with fresh batteries (to see where you’re walking), microfiber towel (in case your discs get wet from rain etc.) cell phone (for safety), score cards and writing utensil, mini marker discs ,bug spray, water and snacks! The most important essential you will need for night disc golf, are the glow in the dark discs of course! There are many different types of glow in the dark discs you can get now adays. My favorite are actually the LED light up discs by Nite Ize. These are great because they give off more light than the glow discs that get charged by sunlight. They also come in fun colors. 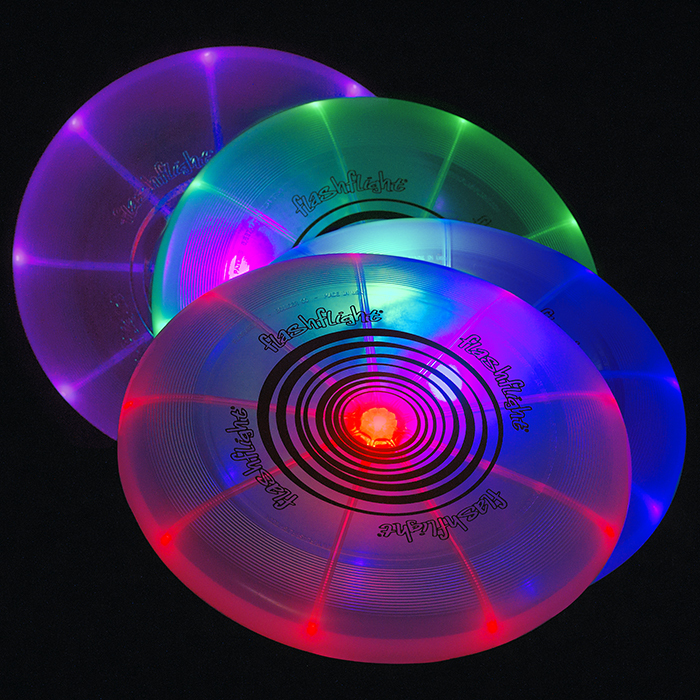 These discs are 185g and is equipped with a single LED light and 9 fiber optic bands that push the lights towards the outside of the disc. They are also water proof! The cool thing about night disc golf discs, is they are usually cheaper than regular day time discs that don’t glow. Be sure to always track your disc after you throw! 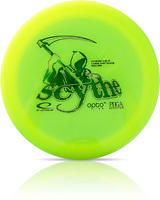 Just because you have the brightest disc in the bag, doesn’t mean it can’t get lost under some leaves or down a ditch. As disc golf continues to grow as a sport, like any other athlete, it is crucial to determine what your style is. Sydney Crosby likes to play with a CCM hockey stick with minimum to no curve, Pro soccer player Lionel Messi swears by his orange and blue cleats. What will your style be out on the course? Maybe you have a couple signature colors you can upload to your discs. Or maybe, it’s a certain animal you want stamp on your discs. Personalizing your discs will help you distinguish your self as an athlete! Most team sports have jerseys with numbers and sometimes last names printed on the back. If you’re on a Ultimate Frisbee Team or Disc Golf team, do you have any sort of team unity gear? 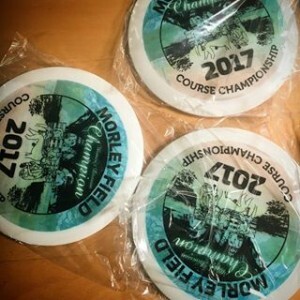 A huge trend in the disc industry for 2019 is getting team names or personal PDGA numbers on discs or frisbees. In the future, all discs will have some sort of personalized touch to it. Get a head start and design some discs for your team! Ready to Put Your Trademark or Logo on Your Own Custom Disc or Custom Frisbee? We often get submissions of disc designs which include copyright images such as, Gucci, Louis Vuitton, and Supreme (just to name a few). While we’d love to print them, it is highly illegal. A creative way to get the same look, is to tweak the logo and Photoshop your own initials or name into these famous brand logos. Replace Louis Vuitton’s famous LV print with your own initials, or write your name in block letters with red box around it like Supreme does. There are many ways to get the same look while staying within the laws of copyright. If you don’t want to use your name or initials, tag lines can be a great substitute when creating your brand. 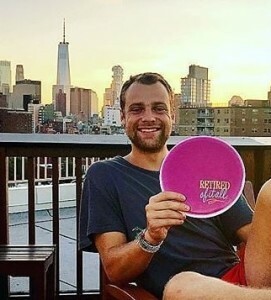 Something short and catchy much like Nike’s tag line “Just Do It.” Jon Paache, a FlyDisc Team Member created one for himself which he prints on his discs and gear. It really set’s him aside from other players and gives him the confidence and professionalism on the course. The tag line “Retired of it all” is Jon’s trademark and words he lives by on and off the course. 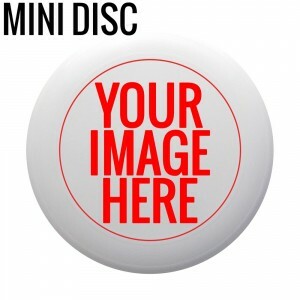 If you’re printing multiple discs with the same logo, use different backgrounds to give them all a unique look. You can choose from solid colors, or a color fade, or even a fun pattern from our backgrounds library. If you aren’t feeling the designs we supply, you can upload a background from the web to put your logo over. 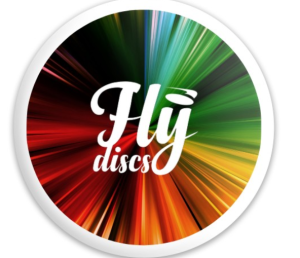 Whatever you choose, your disc will look great and you will feel great knowing you designed it! Check out how we put our logo in black or white on top of some backgrounds from our app’s free background library here as some examples. These were designed easily in less than 2 minutes! It really is that easy, so go for it! Choose fun photos to upload on to your disc. Your disc will stand out from the crowd with personalized photos. Using our customizer, you can literally upload any photo from your phone or desktop, to your discs! Just make sure they are nice quality and high resolution. If you’re not really a picture taker, not to worry. We have an extensive library available with various photos to choose from or you can choose from the web. 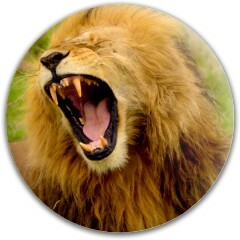 Pictures are a great way to customize your disc because it shows your personality and interests. After all, a picture is worth a thousand words. Large corporations, and their brand names are everywhere. They essentially control how we buy and what we buy. 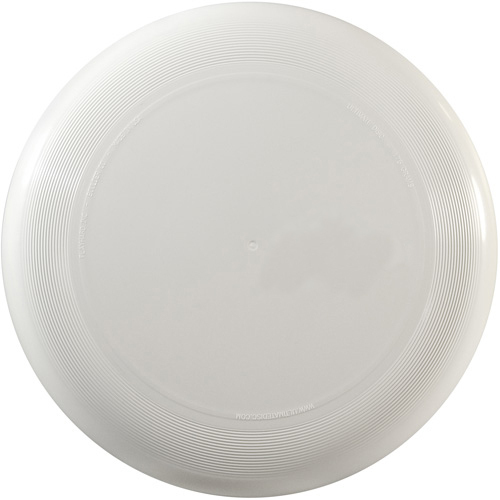 Custom discs and frisbees give you the opportunity to break away from sporting a brand name. We urge you to create your own brand! 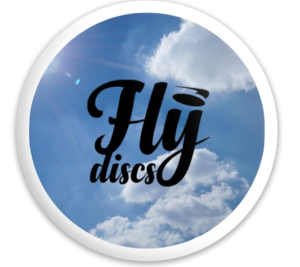 Personalize your disc by writing your name on it with our unique font library! Create a logo for yourself using your own initials! The opportunities are endless when you design your own disc. Whatever you do, make it YOURS. There is no pressure in disc design. You can upload as much or as little as you want to your disc. Have fun and play around with our tools in the customizer. You will be amazed by what your are capable of creating. 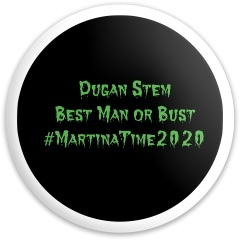 Design a few and save them to your profile. You can always go back and tweak and redesign. Can’t wait to see what YOU can create! Have you ever played disc golf on a crowded course? 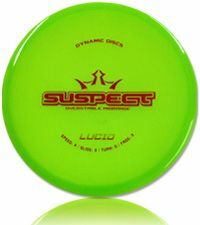 Have you ever gone to fetch your red Dynamic Discs Fuzion Sheriff only to find another competitor reaching for the same one? It’s actually pretty common for players to have the same discs, after all, there aren’t many disc golf manufacturers in the world. 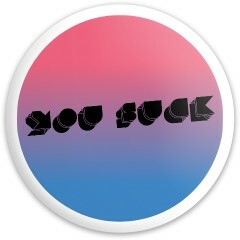 Designing your OWN discs, makes this awkward situation nearly impossible. Creating a custom disc gives you the power to stand out from the crowd. 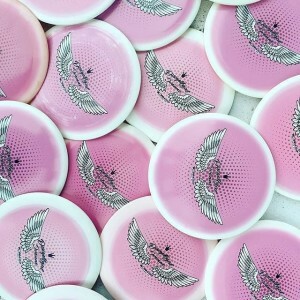 You can design your discs however you want using our customizer. 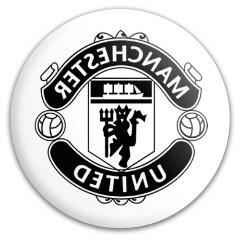 You can even print your name on it! 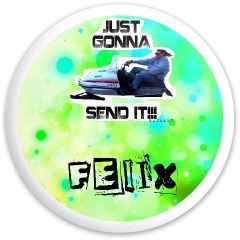 Or, upload a picture of your face on it! However you choose to design your disc, it will be ONLY YOURS. Imagine walking on to the course. You have a bag full of brand-name discs, all basic colors. Your competition walks on to the course and sets down their bag. They take out discs with their own logo they have created. All of the drivers, midranges and putters have a variation of their OWN logo. 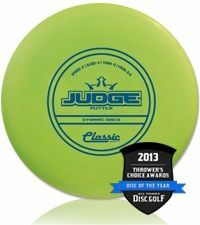 They have built their own disc golf brand. Before the game even starts, they have won. 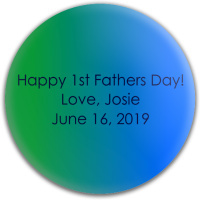 Creating your own custom discs and playing with them on the course gives you confidence and definitely some “cool points”. Custom Discs allow you to express yourself through art. If you’re not really the creative type, there are tons of options you can use to create a custom disc in our customizer. Having a custom disc on the course will set you aside from everyone else. No matter how you choose to decorate your disc, it will be uniquely yours.